Ant-Man is a very mischievous super-hero. So it's up to Cassie to tell her dad to grow up! Watch as Ant-Man shows you just how big he can grow. Can Ant-Man grow bigger than the Hulk? Can Ant-Man grow bigger than the Avengers Tower? But what happens when Ant-Man grows too big? 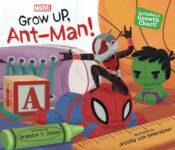 Told using playful repetition, this story will have parents and children alike saying 'Grow Up, Ant-Man!' This book also includes your very own growth chart printed on the inside of the book jacket.